Eschewing realism for arcade-style fun, Raging Thunder 2 by Polarbit is a retro racing game for the iPhone and iPod Touch. Not only are the controls tight and the tracks scenic, the game features on-course “Mario-Kart”-esque upgrades like speed and armor boosters. Polarbit has created an addictive and fun title that brings back the adrenaline-infused chaos of old school racing games and puts it where it is sorely missed—on your mobile platform. The graphics aren't anything to write home about, but hey, it sure is fun. The controls are simple: automatic gas is a default setting, so you don’t have to worry about anything other than turning (using the accelerometer) and braking when necessary. Controlling the car is easy to get used to when using the accelerometer, and, of course, if you play through the career mode and earn money, you can upgrade to better cars with better handling. Tracks have on-course upgrades, such as “boost” (fills up your boost-meter, which gives you a limited speed boost), cash, and extra armor. Careful, though—some “upgrades” are not upgrades at all, and will actually set your wheels on fire and thus damage your car. 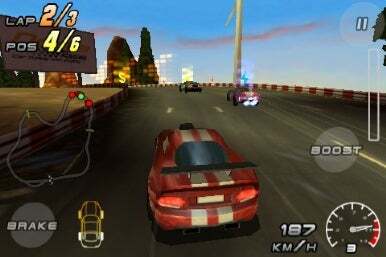 Raging Thunder 2 has a variety of single-player modes, including time attack, survival (last car in each lap is eliminated, career mode, instant race (random track, random car), single race, and arcade mode. Raging Thunder 2 also has an online multiplayer mode that will allow you to tackle opponents from around the world. While such a feature is now common on the iPhone, with racing games like Raging Thunder, it’s especially important. Unfortunately Polarbit is going to need to update it sometime soon, as I had several multiplayer matches that ended up crashing the game. The graphics are not excellent—kind of choppy and blocky and reminiscent of Mario Kart 64—but I wasn’t paying too much attention to the quality because the gameplay was so addictive. For those who do care about the visuals, though, the courses are a vibrant collection of courses: from jungles and temples to ice caves and the Great Wall, you’ll be racing through distinct locales. Overall, Raging Thunder 2 is a solidly addictive racer for the iPhone. The only complaint I had was the somewhat buggy multiplayer mode. The gameplay, scenery, and graphics made me nostalgic for the glory days of racing on the Nintendo 64.